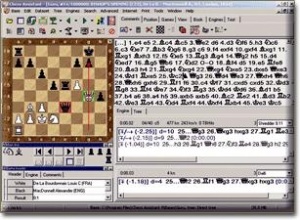 a chess GUI and database developed by a team around Victor Zakharov since 1988 , commercially distributed via ChessOK, a brand name of Convekta Ltd., early versions running under MS-DOS, subsequent versions under Windows. The sophisticated GUI allows to search and edit games in a database, to edit games for web publishing, and is also front end for playing chess online. Chess Assistant 17 is bundled with Houdini 5 and one year online access to Lomonosov Tablebases . The CA database is an organized collection of up to millions of chess games, either in form of (compressed) PGN as interchange format, or as proprietary CA-format, managing classifiers, tree-structures and datasets for data mining and faster CQL access. This page was last edited on 2 June 2018, at 10:15.